I’m always making granola of one type or another but never seem to actually post recipes. Maybe because in real life I’m more of a dumper than a measurer, at least when I make granola. This Healthy Almond Coconut Granola, though is just too good to be missed, so I measured! Feel free feel to tinker, though, to suit your tastes. I do try to eat healthy a lot of the time hoping it balances out some of my desserts? Maybe not, but oatmeal is one of my go-to breakfasts and I’m always munching on the 10 almonds I’ve supposed to eat every day. But that gets old after a few years. Old, old, old. So I like to change things up with recipes like my home-made Swiss Bircher Muesli or as I call it, Fake Familia, and granolas like the Gingerbread Granola I posted earlier, and now this Healthy Almond Coconut Granola. Healthy Almond Coconut Granola is so good, you won’t even *think* about it being healthy. It’s light, it’s crispy, it’s crunchy & chewy at the same time. You’ll just want to keep munching on it. But go easy and remember that anytime you’re using a dried fruit like coconut (and the few berries I like to add for color & that satisfying chewy factor) you’re eating concentrated flavor. This recipe is heavy on the nuts, too, which aren’t low calorie even though they’re so good for you. I try to “formulate” my granolas so a serving gives me the 10 almonds I want to eat every day. Cereals are also one of those items that, when you eat, you want to think about how the brain is signaling that you’re full. That is one thing about granola, it does take a bit of time to chew so your brain can catch up with your tummy. You almost hafta eat it slowly and chew thoroughly. I like to use unsweetened coconut (but even though I actually like it best made with sweetened!) & like honey as a sweetener because honey helps the granola stick together. If you’re a maple fan, try maple syrup, but the more neutral honey flavor lets the other ingredients shine. A little almond extract brings home that almond flavor, and coconut extract or vanilla are both good., too. I don’t use coconut oil for a lot of my cooking (3rd world countries & destruction & all) but I do like it in my granolas. It gets all melty and helps everything stick together because it is thicker again at room temperature. I keep it in the fridge for freshness. When I measure it, I take it out ahead so it’s soft or nuke the jar for about 25 to 30 seconds. Then I measure using the “displacement” method. If you’re not familiar with displacement measuring, for this recipe, add 2/3rds cup of cold water to a 1 cup glass measuring cup. Add spoonfuls of the coconut oil to the water until the water level comes up to one cup. When you drain it, the water just sloughs off and you’re left with 1/3 cup of coconut oil. When I make granolas, I go easy on the oils and sugar. That means it’s not as sticky as some granolas, so I’ve found a method that gives me some clusters. (I LIVE for those clusters, don’t you?) I spread the granola out on two sheet pans, then press it down. Halfway through, I rotate the pans from bottom to top and turn them front to back so the granola cooks evenly. They’ll be some areas that are browner and others lighter, but that just adds interest. Then before I touch it, I let it cool on the sheet pan, then carefully scrape it off the sheet pan with a thin, metal spatula, breaking up the granola as needed. Ok, I confess: usually I just eat any pieces that need to be broken up. Problem solved, lol! As far as cost, oats are really dirt cheap (and healthy, too!) and I used the Quaker Old-Fashioned. They’re generally on sale in the early fall and that’s when you’ll find coupons. Supply & demand, right? The harvest’s over and the warehouses full. Stock up, because the new harvest won’t start coming in until the following May. Honey is an ingredient I shop carefully for. (Pause for a shout-out here for my dear friend, Jenni, who gives me a bottle of special honey, every year, that she picks up as she travels around!) I do watch for coupons and sales. A surprise: Honey is often on sale at the drug store. Watch the ads and pick it up at a low. If your honey has hardened & crystallized, don’t toss it! Put it in a container with water up to the level of the honey in the jar and microwave it until the honey melts. Pour it out of the jar, clean the jar and replace the honey. The same can be done in a pan of simmering water. As far as almonds go, any nut is going to be at the lowest price of the year late fall and around the Christmas sales, and almonds stay fresh, tightly wrapped, in the freezer for months. If you don’t buy then, check Aldi and Costco. The prices at both places are close. Coconut is another holiday sale item, usually cheapest around Christmas and New Years. Use your coupons. Keep it tightly sealed in the freezer inside a second bag like another Ziploc; it doesn’t freeze solidly, so you can usually measure with no problem. It not, leave it on the counter for a few minutes. As for the coconut oil? I don’t buy it often enough to recommend a strategy, nor have I ever seen it on sale at the store. Maybe you have a strategy for a cost-effective way to pick up coconut oil? A very lightly sweetened and healthy Autumn Almond Pear Granola for breakfast, snacks or yogurt. This is not your Mamma’s granola; it’s delicate and toasty in flavor. Preheat oven to 325°F. Have two baking sheets ready. In a small bowl add coconut oil and honey. Heat in the microwave in 30-second increments, stirring after each until melted. Add salt & extract of choice and whisk until well combined. To a large bowl, add oats, coconut, almonds, and berries. Mix, then drizzle with the honey mixture and mix again until all is coated. Turn out onto two sheet pans. Gently press with a flat-bottomed cup (spray the bottom with cooking spray if desired) until mixture is evenly flattened and compressed. Bake 18 to 20 minutes until granola is golden brown, rotating the cooking sheet(s) halfway through. When cool, use a spatula to loosen the granola from the sheet pans, breaking into chunks. Stores well for two to three weeks in an airtight container; for longer storage, freeze. Note on oil and honey: the 1/2 cup amounts will give you a better tasting granola that sticks together better, but if you want to err on the lighter side, it can be reduced to the 1/3 cup measure. Nutritional information based on 1/3 cup each of honey and coconut oil, unsweetened coconut and mixed dried berries with no added sugar. Take a nibble or two of the mixture after mixing and before pressing so you can decide if you’d like to alter any of the ingredients. Perhaps you’d like it sweeter. This entry was posted in Click here for Fabulous Food Posts and tagged Almonds, Breakfast or Brunch Dish, Coconut, Coconut oil, dried blueberries, dried coconut, dried cranberries, Dried Fruit, Granola, Nuts and Seeds, Oatmeal. Bookmark the permalink. Hi Jsdine,, thanks! I was going to make it tonight, actually, then went a little wild. Let’s just say a German Chocolate version is coming nest! Thanks so much! This one is truly a fave! Thanks! Its really become a fave! Looks delicious! 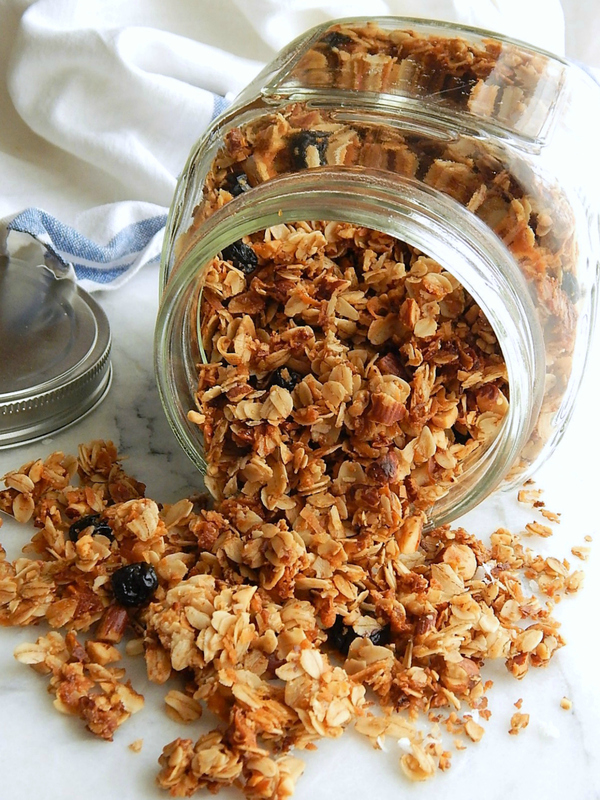 Love crunchy homemade granola! Thanks Ursula! This one’s a keeper! I’m like you – dumping and pouring this and that… no recipe required. But this granola is great – I love the ingredients. It would make a wonderful gift! Thanks Mimi! Wouldn’t that make a fun post near Christmas, food gifts? Looks delish! Can’t wait to try! That granola looks super delicious and I love coconut, being a south indian so can imagine the aroma and the nutty flavour. Enjoy the spoils! Have a lovely day! Great $ saving tips Mollie – as for coconut oil bargains my tip would be to buy it in 1 litre jars – they work out more cost effective and they’re also great to keep long term for use for pickling and preserving etc! Thanks Laura! That’s so good to know! I’ve been thinking for awhile it would be better to make the granola instead of buying it bulk at the co-op. What a great version! I am seriously gonna get my wife to whip this up for my next camping trip…next week. Fingers crossed she’ll do it, this is just what I like to snack on and I can have it for breakfast with some powdered milk! Lol. you are the master cook! 🙂 You must be like some couples and have kind of a “division” in the kitchen, each with their own specialties. Lol! You’re right – It’s a delicate dance in the kitchen because we’re like to be in there. Looks so golden and crispy Mollie– perfect! And love your new blog look– so clean and beautiful, really makes the food photos stand out! hugs hugs. Thanks Rhonda. I’m worried about the GIANT pictures, so I’m not completely sold on it. We’ll see! The fact that you can play with granola recipes so much is one of the best parts, but it is nice to have a good idea where to start. This looks fabulous! I think you’re right! And when you make your own, you never have to be bored with it, just change it up all the time. You and me both! It’s usually a handful of this and that which is kinda hard to translate into a recipe. Great recipe by the way. Thanks, Sheree. I have to confess that when my daughter wanted some of my recipes years ago, I actually had to remake them so I could measure! I put together a book for her and that is part of how my blog started.